The MPOA dredging contractor continues to work on the O’Brien Shoals area. 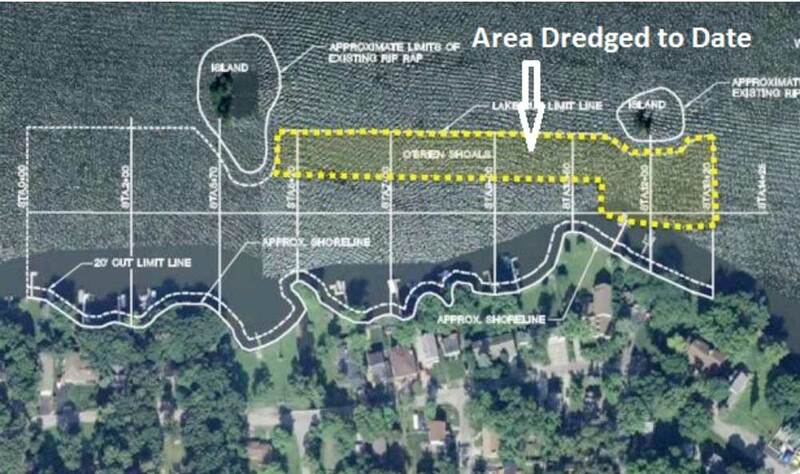 The following exhibit shows the approximate extent of the dredging conducted to date in that area. The dredging contractor has indicated that they intend to work as long as temperatures allow this fall. Typically, this may be up to the end of November. Depending on how far the dredging contractor gets this fall, the plan is to have them resume work as soon as possible in Spring 2016 to allow them to complete any remaining areas at O’Brien Shoals; Wickline Island, and Lookout Point before the start of the boating season. It is hoped to have any dredging near shoreline areas completed before the start of the 2016 boating season, to prevent any delays in piers being installed. On October 27th, 2015, I made a presentation at the Illinois River Conference in Peoria about water quality projects being implemented by the Nippersink Watershed Association with IEPA funding. These IEPA projects help protect the water quality of Nippersink Creek and Wonder Lake. On November 4th, 2015, I conducted the final IEPA required groundwater monitoring event for 2015 at the Wonder Lake SDF site. Results will be forwarded to IEPA when received. Sampling will be resumed in Spring 2016. To keep things consistent with how the process for applying for an MPOA boat decal works, the MPOA is updating the requirements for snowmobiles and ATV’s. Additional information will be provided by the MPOA Office.